On the right side of your Gmail inbox, you will see the Lattice plugin - you are all set! 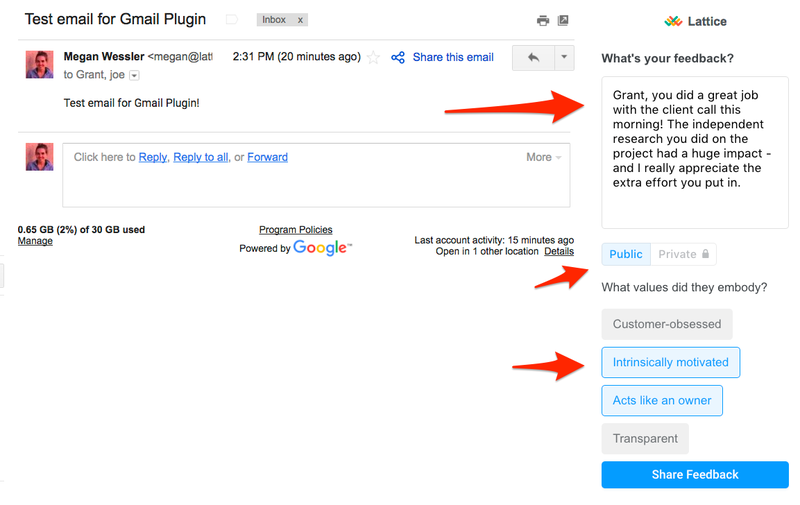 Once the plugin is installed & you are in an email thread, participating team members will appear in the Gmail plugin. Select the feedback recipient and select the feedback type - either "write note-to-self" or "share feedback". (Note, writing a note-to-self will be private and not shared with anyone else). 3. If you select "share feedback" you can make the feedback public (shared with your whole team), or private (shared only with feedback recipient). Either way, the feedback will be recorded in both your Lattice feed, as well as the recipient's - which will come in handy when its time to complete reviews. 4. [Bonus points] If your admin has set up company values, you can associate a value to the feedback before submitting the feedback. Learn more about values here. You must be signed into Lattice to leave feedback. Your team member must be an active Lattice user for you to have the ability to leave them feedback. Need more guidance? Watch our video tutorial about giving feedback in Gmail here.